Can Google's budget tablet trounce all the other efforts? It's been the worst-kept secret since Steve Ballmer's love of alternative dance, but at last it's official: the Asus-built, Google-branded Nexus 7 tablet, or just Nexus 7 to its friends, has been unveiled. Its seven-inch screen and powerful quad-core processor means it's a pocket rocket, but is it good enough to tempt you away from a Kindle Fire, let alone a new iPad? Was Microsoft right to try and steal its thunder with Surface? Let the tablet trial commence! There's only so much you can do with the design of a rectangle, and the Nexus 7 - surprise! - looks like a tablet, albeit a slightly glossier, more tapered tablet than the PlayBook-esque Kindle Fire. Stripped of its colourful covers, Microsoft's Surface is really just a slab with a kickstand; it's a nice slab, but it's still a slab. We think the iPad is the best looking device, especially in white, even if it is a bit thicker than the iPad 2. The big difference in looks, though, is the screen, which of course is the bit you'll spend most of your time looking at: the smaller tablets can't compare with the Retina goodness of the new iPad. Then again, you can't get an iPad into the pocket of your cargo shorts, unless you're a giant. Ready for the numbers? 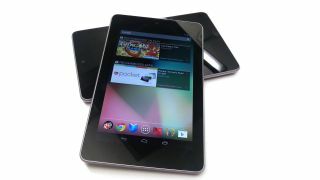 The Nexus 7 has a seven-inch, 1280x800 IPS display, besting the Kindle Fire's lower-res 1024x600 IPS LCD. The iPad's display is bigger and more dense, cramming 2048x1536 pixels into its 9.7-inch IPS panel, although of course there are weight, battery life and cost implications to all those pretty pixels. Microsoft hasn't released full specs of its Surface tablets yet, although an educated guess says that the Surface RT's 10.6-inch "ClearType HD" screen is 1280 x 720 while the Surface Pro's identically sized "ClearType Full HD" display is 1920 x 1080. As you'd expect, the ten-inchers are the porkers here, and the two Surface tablets are the porkiest: the Surface Pro is a whopping 903g, with the Surface RT weighing in at 676g. The new iPad is 652g, the Kindle Fire 413g and the Nexus a positively titchy 340g. The heart of the Nexus 7 is its quad-core Tegra 3 processor, which runs significantly faster and should deliver much smoother performance than the 1GHz dual-core OMAP4 inside the Kindle Fire. Apple, as ever, runs its own processor, a 1GHz Apple A5X. The Nexus's processor has a 12-core GPU, while the iPad's is quad-core. Microsoft hasn't announced exact details of the two Surfaces' processors, but we do know the Surface Pro will pack an Ivy Bridge Core i5 and that the Surface RT will run a Tegra. Which one hasn't been confirmed, but we're assuming it'll be the same Tegra 3 that's going into other Windows RT tablets. Speed isn't just about the processor, of course: devices need sufficient RAM too. The Kindle Fire has the least here, with just 512MB, while the Nexus 7 and iPad 3 both come with 1GB of on-board RAM - although the iPad's RAM has to push a lot more pixels. Microsoft hasn't announced the on-board RAM for its Surface tablets. The Kindle Fire is the stingiest when it comes to storage, with 6GB of usable on-board storage, although Amazon does offer free cloud-based storage for all Amazon content to compensate. The Nexus 7 comes in 8GB and 16GB versions, while the iPad is available with 16GB, 32GB or 64GB of on-board storage. The Surface RT will be available in 32GB and 64GB versions, expandable via MicroSD, and the Surface Pro will be available in 64GB and 128GB flavours, expandable via MicroSDXC. Apple's iPad is largely made of battery, and it delivers an incredible 11,560mAh - which makes the Kindle Fire's 4,400mAh and the Nexus's 4,325mAh look as if they're powered by potatoes.